Well, it made me a little bit crazy to have three WIP's going on at once, but I have to admit that since they were all similar, it went more quickly that I expected. I know that three WIP's is nothing compared to some of you, but I usually only work on one quilt at a time! From cutting the shirts to delivering the finished quilts to my friend, it took one week to get them done, and I just might be persuaded to work this way more often. If you missed my last post, these quilts are made from the shirts of my friend's late husband. The first two quilts are for her granddaughters, and are the most similar, both using HST's and measuring 48 inches square. The third quilt is for my friend herself, and I made it a little bit bigger, measuring 54 x 57 inches. She loved the fact that all of the logos and pockets are incorporated into hers. I kept the backing and binding the same for all three quilts. The Kona Navy is the perfect frame for the shirts, and the chambray backing with the stripe of scraps fits the feel of the quilts perfectly! Some of the shirts had a thicker woven texture, so I quilted these with a wide stipple so that the quilt would drape nicely without being too stiff. I'm so glad I was able to make these quilts for her and her granddaughters. She absolutely loved them, and I know they'll be treasured for many, many years to come. Welcome to the first summer vacation NTT, friends! If it's not summer for you yet, I surely hope it's coming soon. I have been super busy these last few days, making the most of my newfound abundance of time. First of all, I've been working like a crazy person to get my Girl's Best Friend pattern ready to release, and I'm happy to report that it is now available in my Craftsy and Etsy shops. Yay! 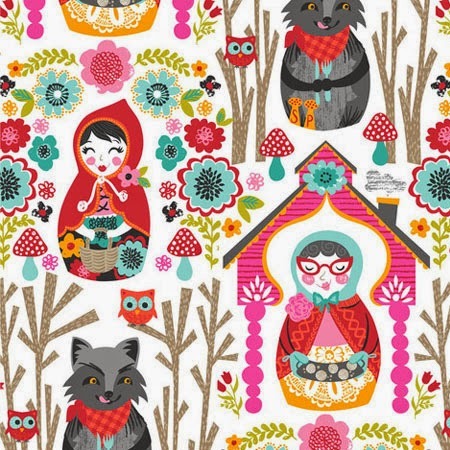 I really enjoyed designing and creating this pattern, and I hope you'll check it out! Another thing that has been taking my time lately is working on a few memory quilts for a friend. She saw the four quilts I made from my grandfather's shirts and asked if I would be willing to do the same for her using her late husband's shirts that she saved. 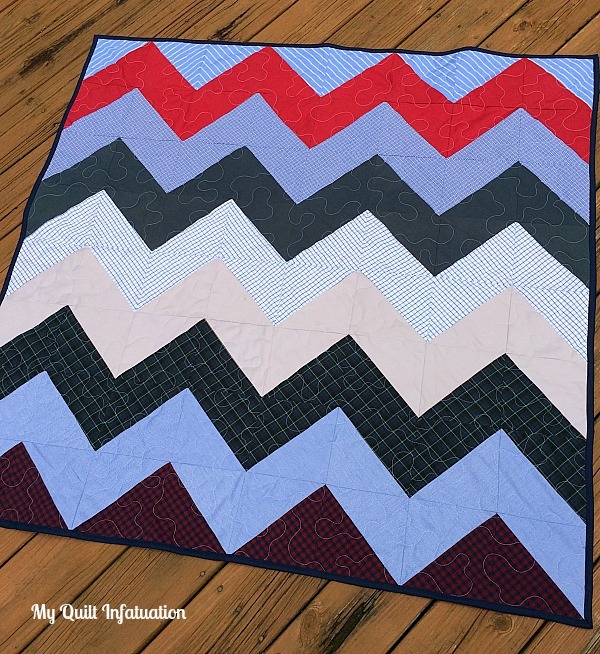 The chevron and HST quilt each measure 48 inches, and will go to her two granddaughters. I chose a pattern using HST's for both of them, because I wanted each to be slightly different, but look like a set. The third quilt is a little larger, measuring 54" x 57," and is for my friend, herself. I incorporated all of the pocket logos in the quilt for her. The trickiest part of these quilts was finding a pattern that wouldn't waste too much fabric, since there were only 17 shirts. My friend primarily wanted the two quilts for her granddaughters, and the third was to be made only if I had enough fabric. I am so glad I was able to make this third one for her, and have it be such a generous size. This is the first time I have worked on more than one quilt in tandem. When I finish, I'll have to decide whether I prefer my usual one at a time method, or if this is faster and easier. We shall see! Okay, time to check out some of the fantastic highlights from last week's party! Let's rock and roll! 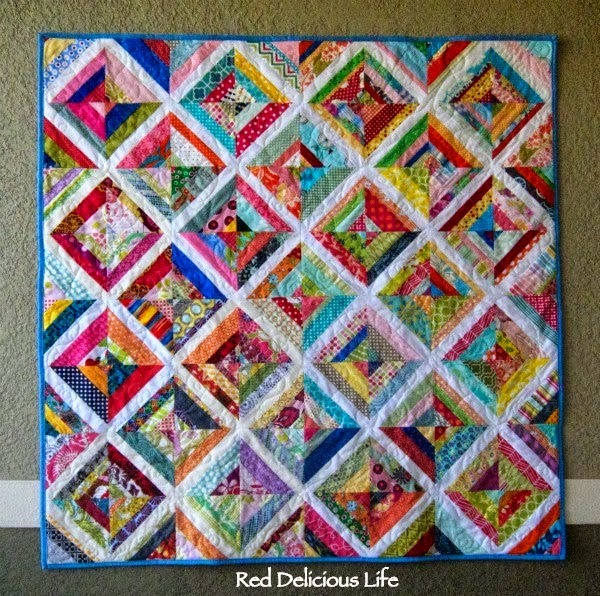 Diana at Red Delicious Life showed off her newly finished scrappy string quilt. 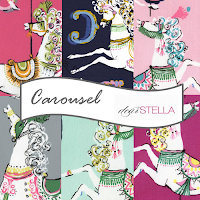 I love all of the bright, happy fabrics! This turquoise and purple beauty from Jess at Quilty Habit is a stunner! 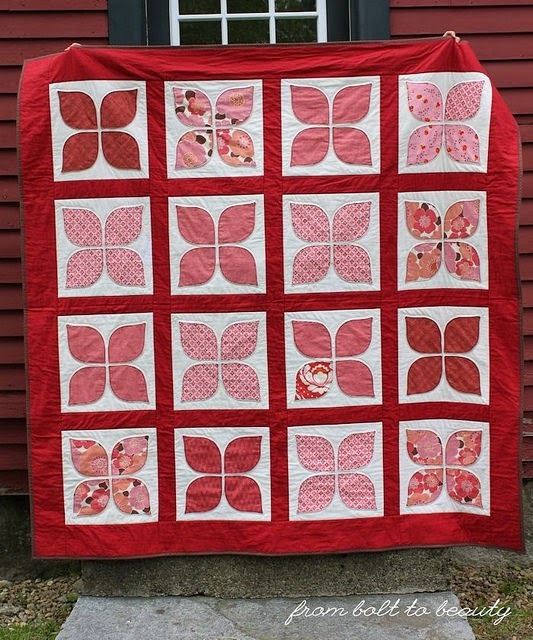 and I love this Dogwood Blossom quilt from Michelle of From Bolt to Beauty! Okay, y'all! I can't wait to see what's going on in your sewing space this week! Happy summer, my friends! Yes, I know that the official start of summer isn't until June 21st (ish), but Memorial Day weekend always feels like the kickoff of summer to me. I also wrapped up the school year yesterday, so life feels pretty free and easy right now. On that note, I have some exciting news to share. I have decided to leave teaching, and spend more time pattern designing, as well as some additional commission quilting. I can't wait to experience all of the fun stay-at-home-mom-benefits that this new flexibility will allow as well. This is a giant leap, but one I felt I needed to take. On this glorious first day of summer, I have finished the two preemie donation quilts for the local children's hospital. 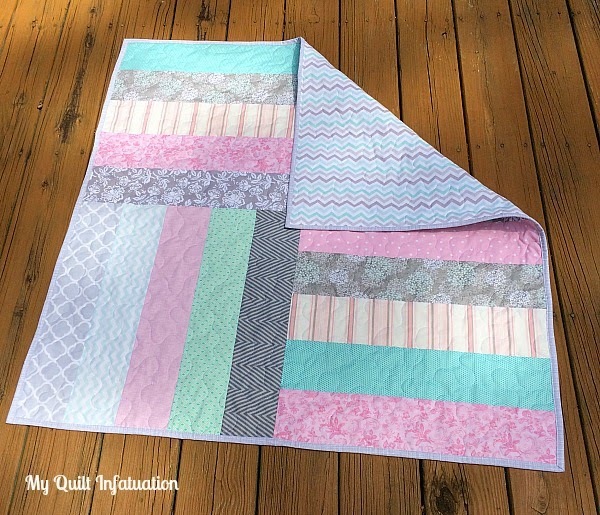 The first quilt is made from the leftovers from my Bubble Bath quilt. I sewed the scraps together using my improv method, then created half square triangles with white. I've never laid out HST's like this before, and I think it is so fun! 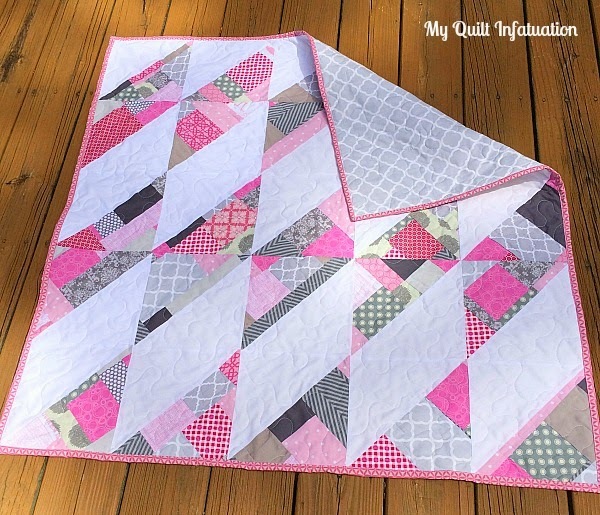 The backing is a pretty gray quatrefoil, and I love the pink binding on it. 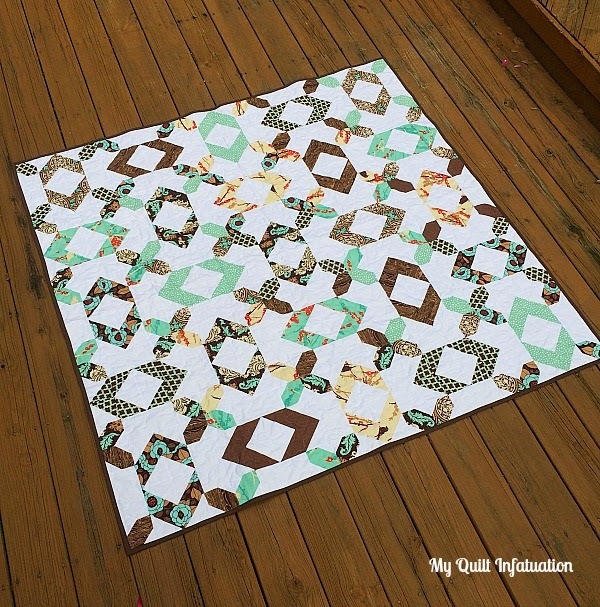 This quilt measures 40 inches square. 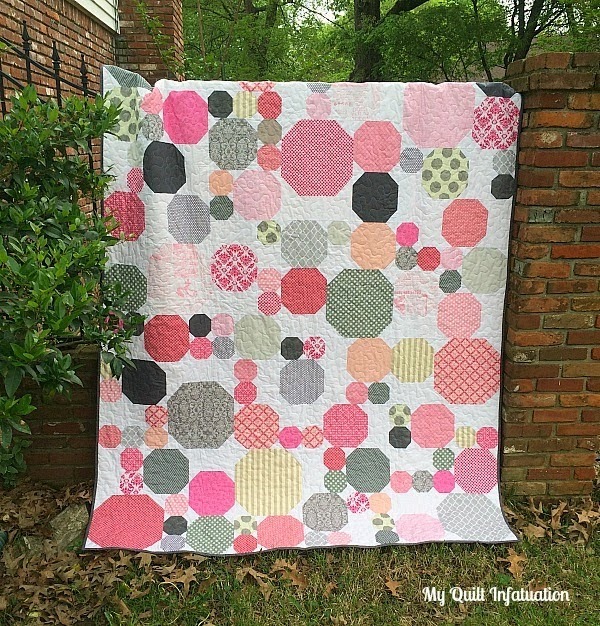 Incidentally, my Bubble Bath quilt is entered in the Original Design category in the Blogger's Quilt Festival over at Amy's Creative Side. Voting opened yesterday, and I would love to have your vote in that category! The second preemie quilt is made from leftover strips from my First Light quilt. It is 40 inches square as well. 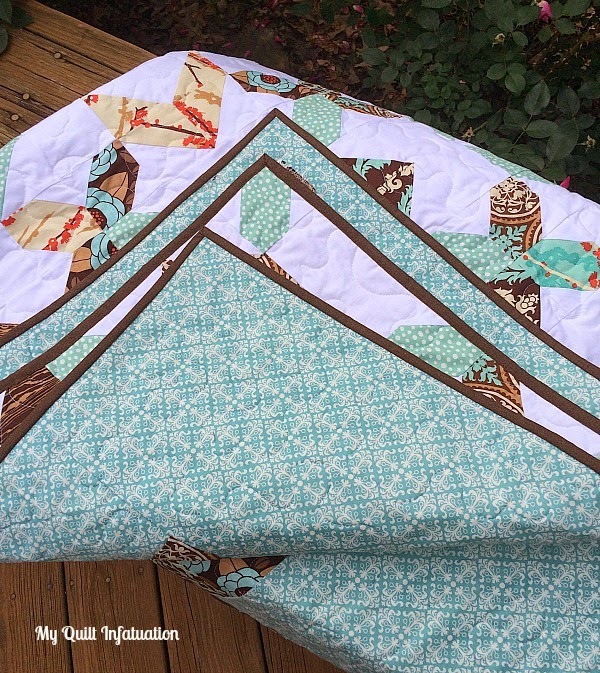 I thought the gray and aqua chevron was just perfect for the backing, and this one has a soft gray crosshatch binding that blends right into the quilt. 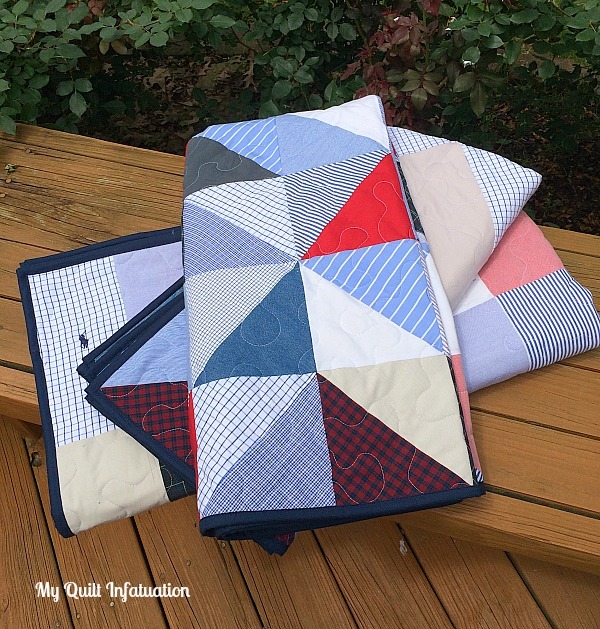 I think I've written about this before, but in case you aren't aware, being able to donate these quilts holds a very special place in my heart. My son was just 3 lbs. 10 oz. at his tiniest, and stayed in the NICU for 5 weeks. He will turn 11 in a couple of weeks, so those days are long gone, but they will never be forgotten. It makes my heart so happy to be able to give these tokens of comfort to families who are experiencing such a tough time. Welcome to Needle and Thread Thursday, friends! Lately, I've been doing a little sewing to benefit the NICU/Infant Ward of our local children's hospital, which you know is very near and dear to my heart since my wild thing was just over 3 lbs. at birth. If the fabrics look familiar to you, it is because they are leftovers from Bubble Bath and First Light. I always try my best to add as little fabric as possible to my scrap jars, so if I think I have enough leftovers for a preemie sized quilt, I try to whip one up between bigger projects. I love scraps, but they can get overwhelming quickly, and it feels so good to know that they are being used to bring comfort to babies and their families during a very tough time. When I finish these up, that will make 5 preemie quilts so far for the year. Okay! 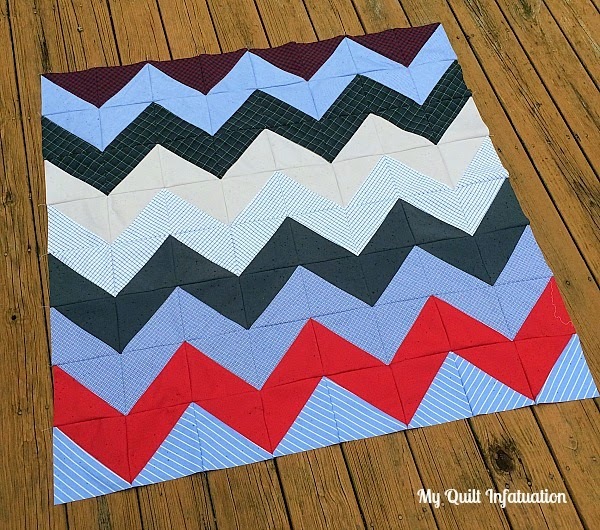 Time to announce the winners of the May Fabric Deals giveaways! 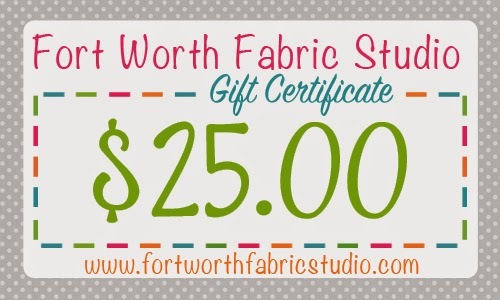 First up is the $25 gift certificate from Fort Worth Fabric Studio. 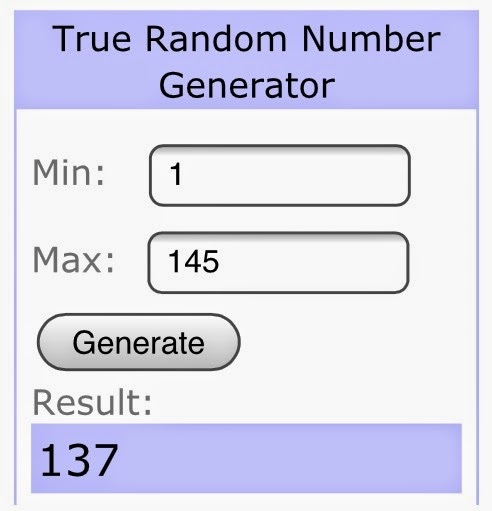 The winner is comment number 137, aus_chick. Congratulations! Second is the gift certificate from Fat Quarter Shop, valued at $25. Comment number 9, Anita is the winner! 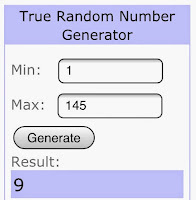 And finally, the winner of the oh-so-fabulous Black and White Cotton and Steel fat quarter bundle from Lady Belle Fabric is comment number 98. Congratulations to PK Sews! What wonderful sponsors you have! Thanks for sharing their great selections. I visited them all! And thank you for your inspiring blog! NOW! Onto last week's highlights! Sometimes I think I'll skip the highlights when I have a lot in a NTT post, but I always do them because y'all BRING IT every single week! I just can't help myself! 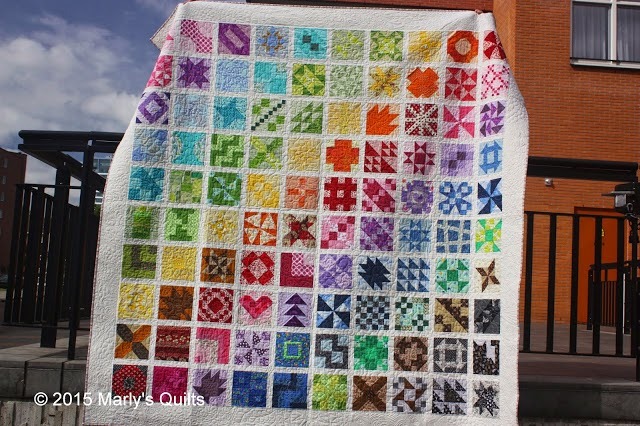 Marly's Quilts linked up this gorgeous rainbow modern sampler. You know I love me a rainbow quilt. Katelyn at Sing While Crafting showed off this fun and bright pineapple block table runner. I happen to have seen this one in person, and it really is stunning. I couldn't resist featuring it! 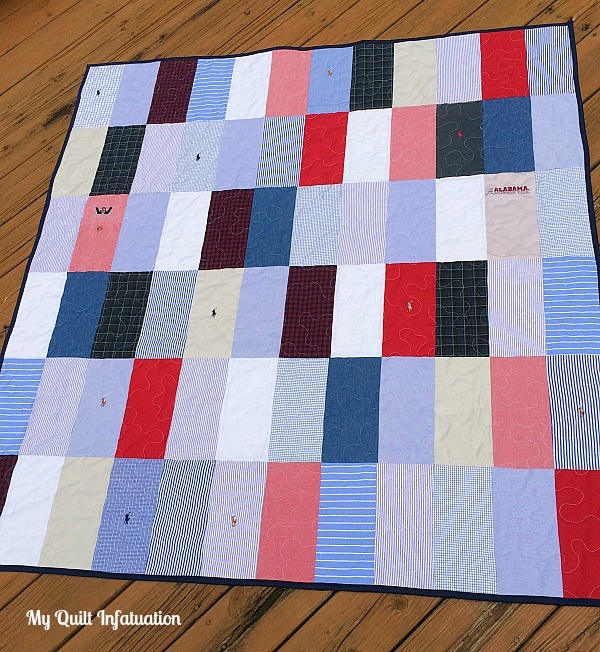 and Tanya Quilts in CO finished up her Journey of a Quilter quilt. This one has been a year in the making and it really is beautiful! I really could have picked several more to feature. Last week's party was so filled with amazing inspiration. I can't wait to see what you're working on this week! Bring it on! Well, it's that time of year again! The time when there is so much quilty eye-candy on display that it's hard to tear yourself away from the computer. That's how it is for me anyway. Yep! 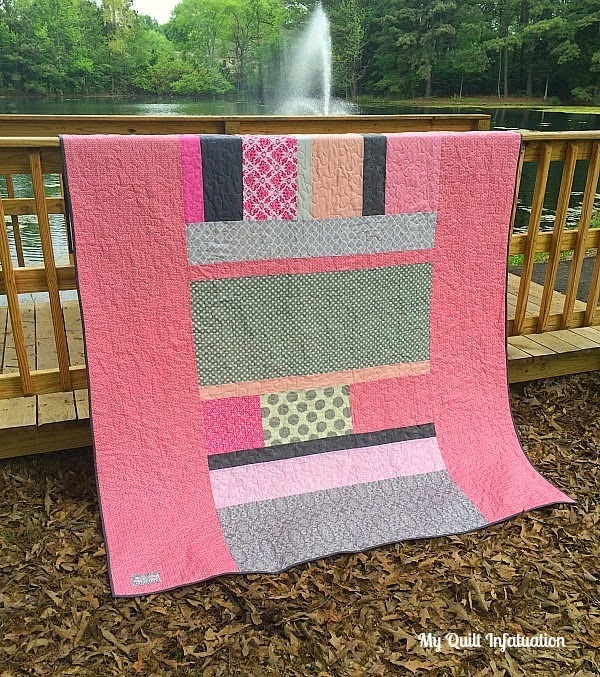 It's Blogger's Quilt Festival time over at Amy's Creative Side! 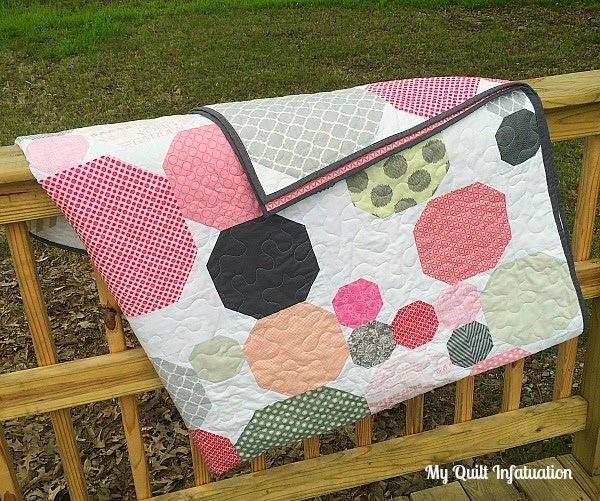 I really thought long and hard about the quilt I wanted to enter, and decided that my Bubble Bath quilt should go in the original design category. It is definitely one of my favorites from the first part of this year, and I published the pattern for it as well. My vision for this quilt was to have the the different sized snowball blocks float across the quilt like bubbles through the air. It took lots of sketching and re-sketching, but I love the finished result. 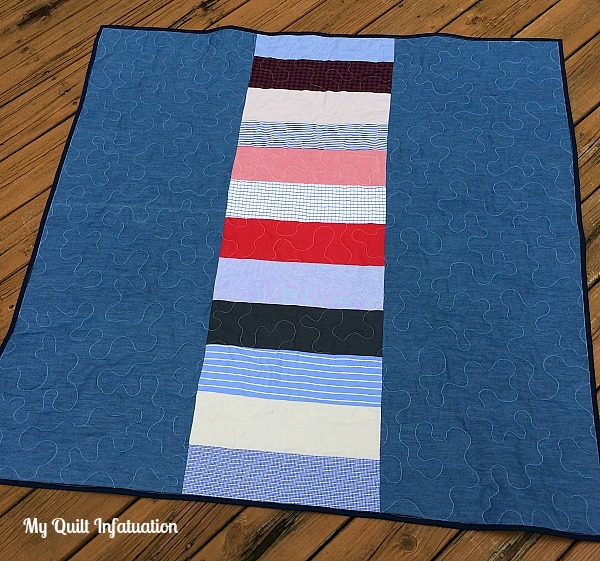 I always try to use up the scraps in the backing, and this quilt was no exception. I really loved creating this design, and it has really inspired me to dabble in more alternate grid work in my patterns. Quilting- free motion stippling by me! Be sure to head on over to Amy's Creative Side and check out all of the other awesome entries in all of the categories, and vote for your favorites on May 22nd! I feel like I've gone over to the dark side. Okay, so I'm being a little bit dramatic, but yesterday I went to my monthly guild meeting, where we had a presentation on how to use Instagram, and I was totally strong-armed into setting up an account. 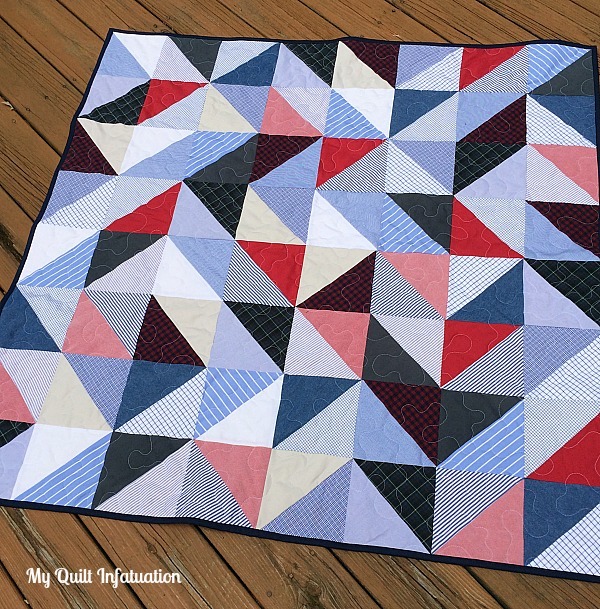 Again, I'm totally being dramatic, but the fact that I am so entrenched in social media and the modern quilting world, and had not yet taken the plunge into Instagram has been the topic of some good natured teasing lately. So it's done, and I'm glad I finally jumped into it. I resisted for so long because I didn't want to over-commit myself to yet another social media platform, and because I love blogging so much that I didn't want this side of things to suffer. 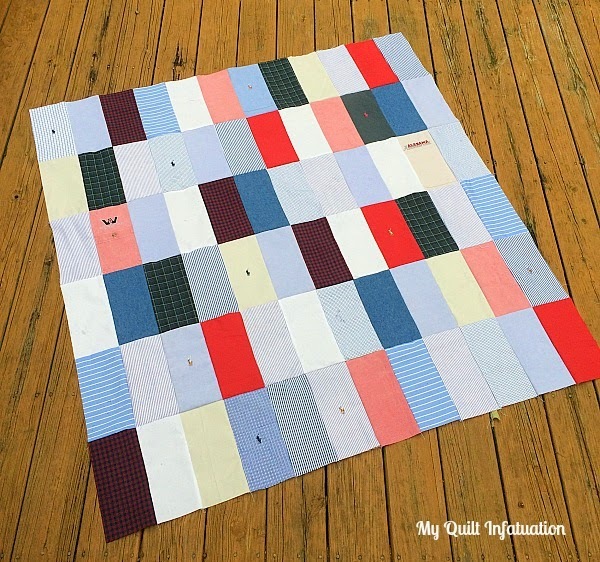 By all accounts though, Instagram is the greatest thing since sliced bread, and super easy to use, so you can find me there at myquiltinfatuation! This weekend, I finished up my latest quilt, and incidentally, my next pattern (in the works). The diamond shape, with the negative space reminds me of a faceted diamond ring, so this pattern is called Girl's Best Friend. 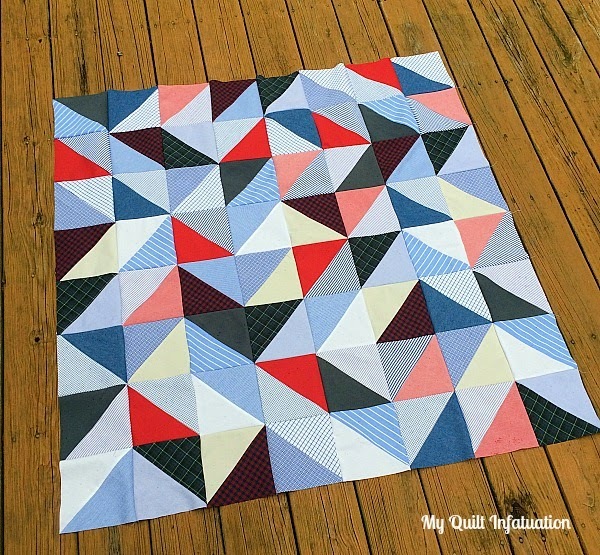 I made a quilt in this pattern a couple of years ago, but I never wrote the pattern. I have made some modifications to it since that first incarnation, and I like this one much better. 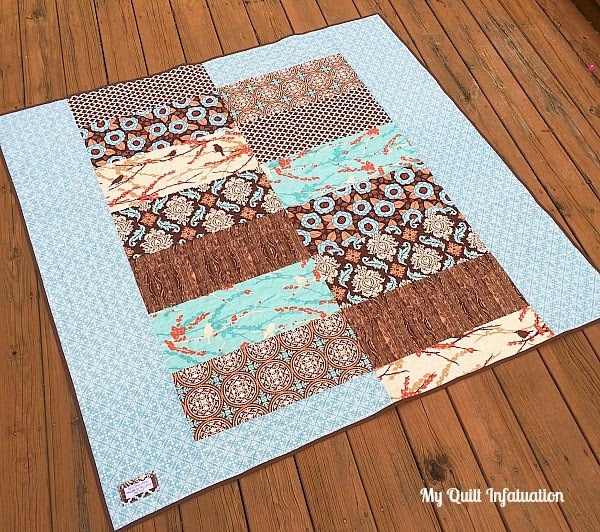 I really love the colors in this quilt, and I'm not one to use a ton of brown in my quilts. This Joel Dewberry Aviary fabric is just yummy though. The palette feels very calm and warm to me. The fabrics were specifically chosen to match a friend's bedroom, and I can't wait to give it to her. I bought half yard cuts specifically so that I would have a quarter yard leftover of each print for the back. I like how the front feels very airy with all of the white, while the backing is an explosion of print. The chocolate brown pebble print fabric on the binding ties the whole thing together so well. 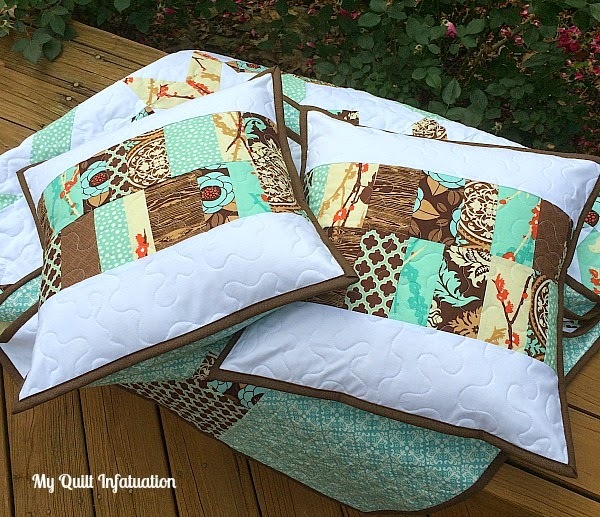 I had just enough small scraps leftover to make a couple of throw pillows for her bed to match the quilt. They are backed in the same Tiffany blue damask, and have the same brown pebble binding. Each pillow is 16 inches. I'm so excited to take these to school tomorrow and give them to her, and I hope she loves all of them! Welcome to another month filled with awesome coupons, features, and sales. May is such a busy month for me, but also one filled with quilty planning and anticipation. Summer vacation gives me SO much time for quilting, and I find myself splurging on lots of fabric at this time of year. This month, my fabulous sponsors have some really great things to share, and several giveaways are sprinkled throughout the post so read on! Let's kick this off with the first giveaway! Fort Worth Fabric Studio is offering a $25 gift certificate to spend any way you choose. I know I have a list of fabric "needs" a mile long, but in case you don't already have plans on how to spend it, check out some of the latest sale info, as well as their recently added collections. You can save 30% off Riding Hood by Blend with code RIDING30, good through May 21! Carousel by Dear Stella is 40% off with the code CAROUSEL40, good through May 21 (includes yardage, blenders, and a limited supply of FQ Bundles and Half Yard Bundles)! 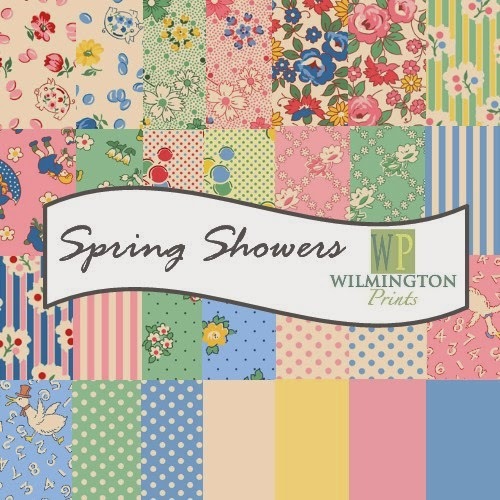 and the latest line in the shop is Spring Showers by Kaye England for Wilmington! Be sure to hop over and check out all of the great things going on there! 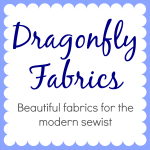 Dragonfly Fabrics is offering a coupon for 20% off your total order, through May 24th. 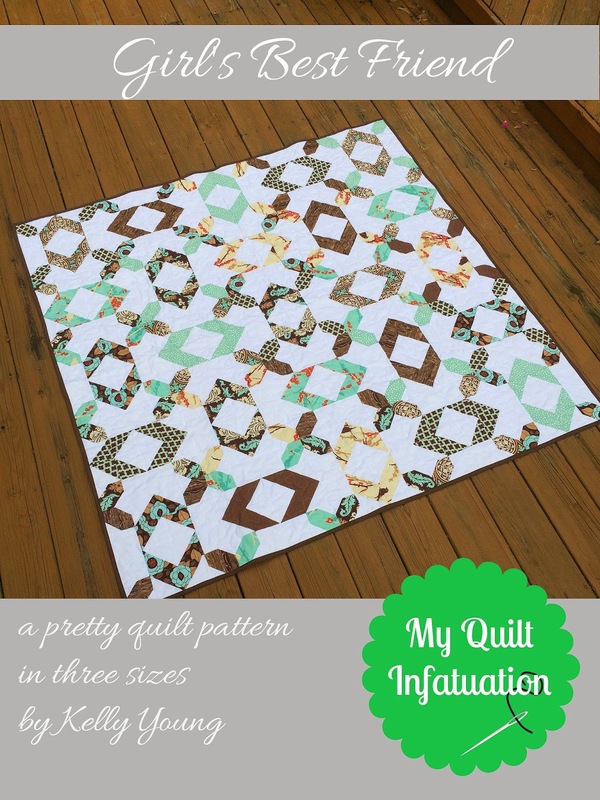 Just use the code QuiltyLove20! One of the best things about Dragonfly Fabrics is that they photograph every collection they stock, and handpick solids that coordinate perfectly. So, you don't have to leave your solid choices to the "chance of the computer screen." You know that the solids you're getting will match! 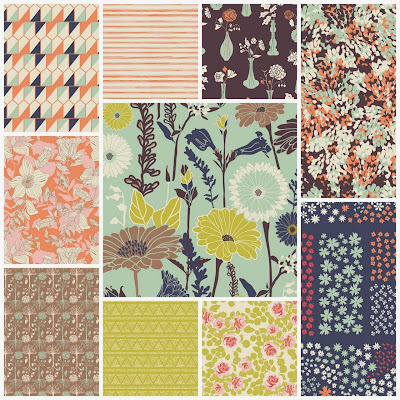 The latest collection at Dragonfly Fabrics is Cultivate, by Bonnie Christine for Art Gallery Fabrics. This is such a pretty and soothing palette. There's always lots going on at the Fat Quarter Shop, and this month is no exception! It's time for their Designer Mystery Block of the Month program. 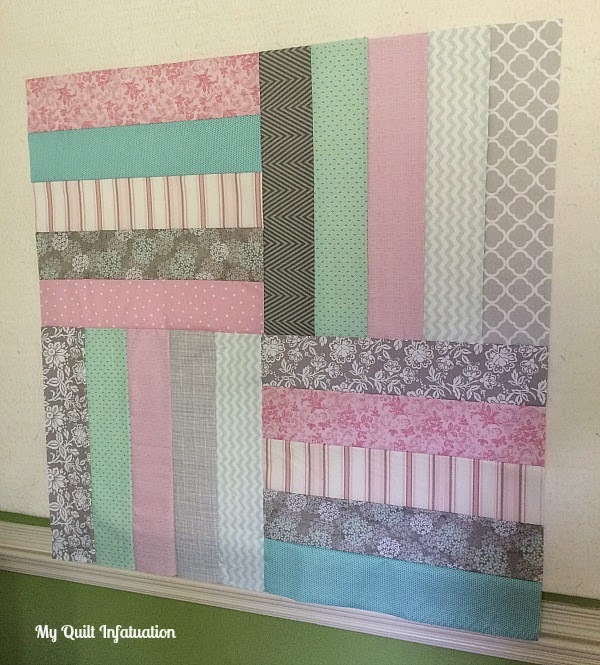 For this program, they have invited 12 Moda Designers to design a block for the quilt. 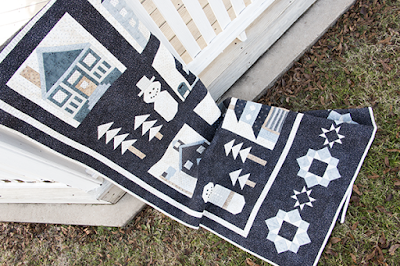 This year’s quilt features the Snowman Gatherings II Collection by Primitive Gatherings for Moda Fabrics. Check out all of the pertinent info HERE! 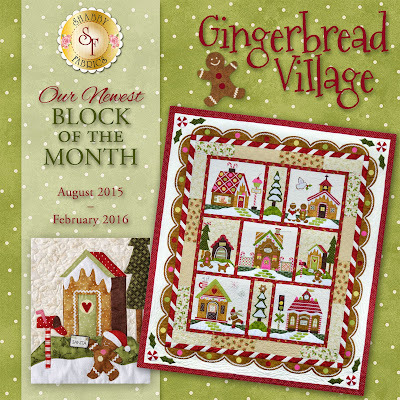 This Block of the Month will begin in June 2015 and run through May 2016, so get ready! Here's a little sneak peek for you! Fat Quarter Shop is also graciously hosting our second giveaway! They are offering a $25 gift certificate, and believe me, you could get lost for hours in the pages of their shop deciding how you want to spend it. 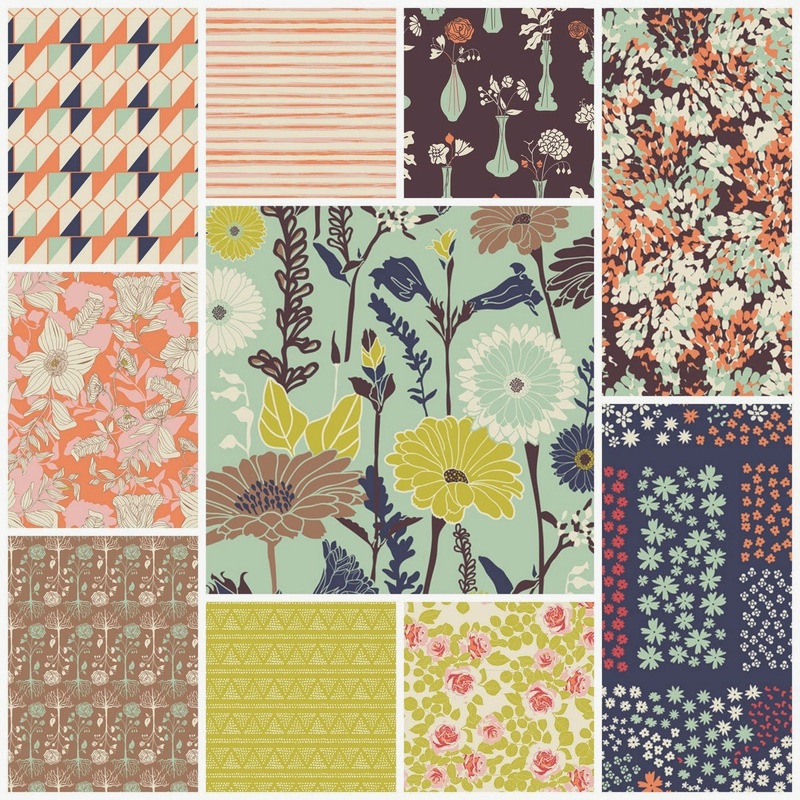 Shabby Fabrics has just added 6 entire collections to our “On Sale” section where you can save up to 30% off of over 1,200 fabrics! You can find their huge sale section HERE! They are also getting ready for a holiday block of the month: Gingerbread Village! This is a 7 month program that runs from August 2015 to February 2016. The BOM includes all of the patterns, the accessory packet, all top fabrics, borders, binding, and ric-rac that are needed to complete this charming 62” x 72” Christmas quilt! They are offering this BOM in a pre-fused laser-cut option as well as a traditional option. 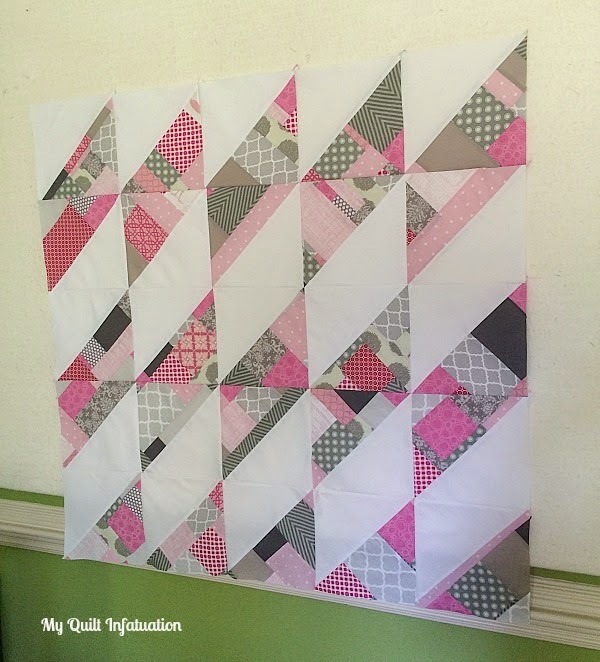 Check it out HERE, and take a look at the adorable quilt! Christmas is one season where I embrace the "cutesy." 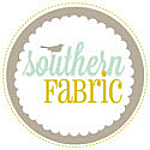 Next up is Southern Fabric. I can't even begin to tell you how many great deals I've gotten through their Daily Deal. 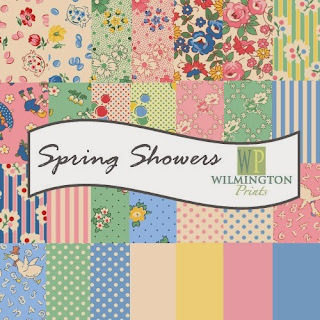 For example, as I type this post, their daily deal is 40% off of a Winterberry Jelly Roll... 40%! If you don't happen to see this before the deal runs out, don't worry! There will another deal equally as awesome. If you've never taken advantage of these amazing deals, you are really missing out! You can even sign up to have them emailed to you HERE. Southern Fabric's latest collection is Skopelos by Katarina Roccella. Oh my goodness. I am in love with it! 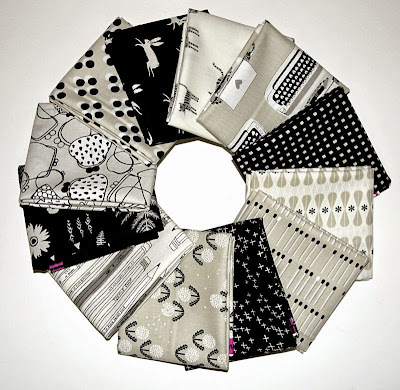 They have several new Arrivals this month, like Gardenvale by Jen Kingwell, Winterberry by Kate and Birdie Paper Co, Black & White by Cotton + Steel and Cultivate by Bonnie Christine. 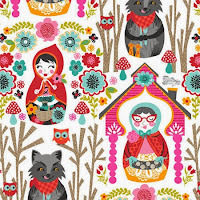 On Monday, they will be getting Holly's Tree Farm, and will have fat quarters and Half yard bundles in stock. Other precuts should come a little later. They also have lots of deals going on with no coupon code needed! Gardenvale, Daysail, Fresh Cut, Color Theory and Ambleside full collection fat quarter bundles are all on sale this week for $90.00! and Feed Company is on sale for $85.00. If you're a Bonnie and Camille nut like I am, you can also preorders Hello Darling. 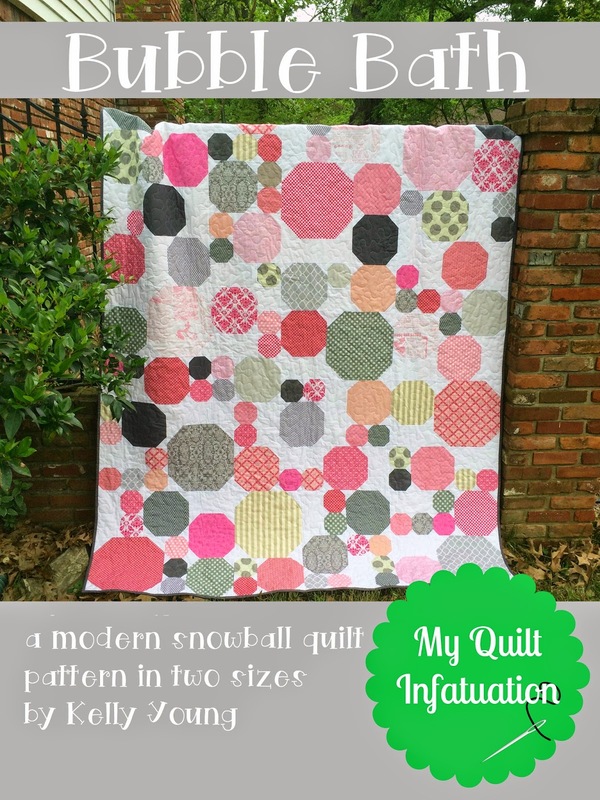 As soon as it arrives, Holly's Tree Farm fat quarter bundles will be on special for $90 as well. You can also follow Lady Belle on Instagram @becker1210! Lady Belle Fabric is offering a fat quarter bundle of the NEW Cotton and Steel Black and White collection! Eeek! I wish I could win them myself! Aren't they gorgeous? Soooo....I know you all want to know exactly how to win one of these three fantastic giveaways. Well, all you have to do is leave a comment here to enter and thank my generous sponsors by browsing a few shops. If you are a no-reply blogger, please be sure to leave an email address so that I can contact you! 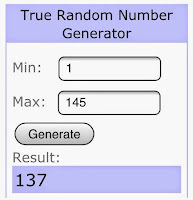 Mr. Random will help me choose the winners on Wednesday, and I'll announce them in my NTT post on Wednesday evening. Happy shopping and good luck to all! 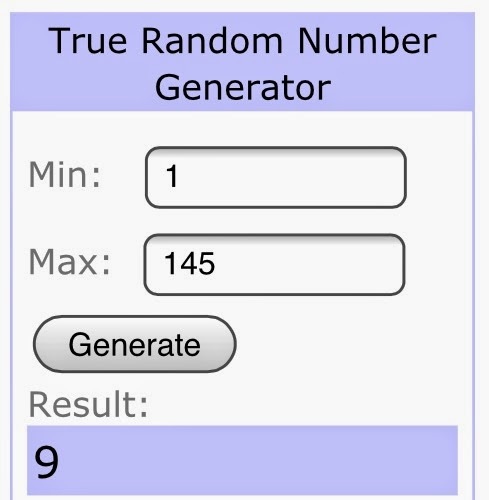 This giveaway has ended. Be sure to become a follower so you won't miss the awesome deals and giveaways next month!